Well, these puddings look good, don't they? Like if you were to dip a spoon into one of them, you would emerge with a creamy mound of rich, dark chocolate that would fill your mouth with joy and happiness. 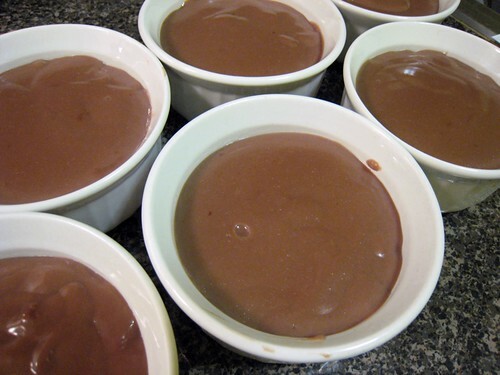 Granted, this was a low-fat recipe, using skim milk and cocoa powder instead of cream and melted chocolate. I chose this one because I was planning on serving the pudding at the end of a fondue meal (post to come! 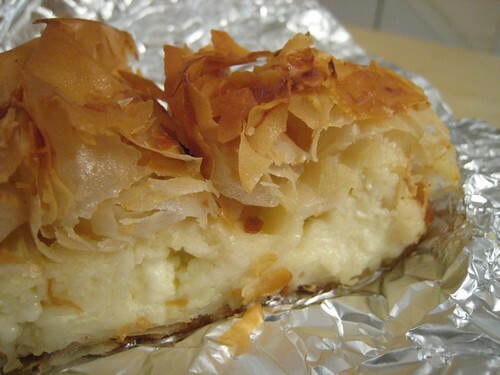 ), and I thought it would be good to have a sweet dessert that wasn't too rich afterward. Reviews and descriptions had led me to believe that I wouldn't be able to tell the difference, or if I could, I wouldn't mind. But call it something like a bland chocolate flan, and it might be close. My very kind friends described the texture as "somewhere between Jell-O and pudding." 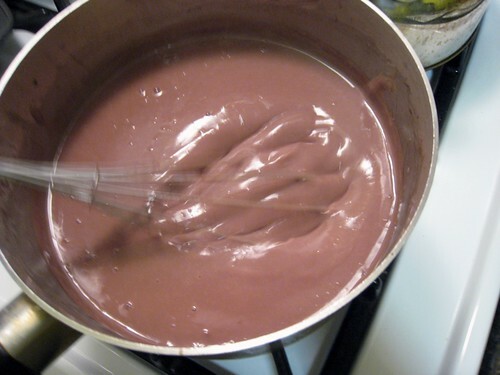 It wasn't sweet enough, chocolately enough, or smooth enough; each pudding was a stoic gelatinous blob into which spoons sliced rather than sank. I knew from how fast the hot pudding had set that something in the texture might be off, but by then it was too late. I could have experimented with re-cooking it and thinning it out I suppose, although I have no idea if that would have helped. Well, at least I got to use my set of ramekins for the first time. After the Sunday Gospel Brunch, I decided to hit the Upper West Side. There was a period of time when I used to be here often, but these days I'm rarely in the area unless I'm going to attend something at Lincoln Center. Since I had a free afternoon, and I was close enough already, I caught the 1 train at Times Square to 72nd Street. After poking around in Fairway for a while, where I bought some cheese, JSK joined me and we headed to Arte Around the Corner. I'd been wanting to try one of their herb-honey slices after reading about them here and here, but there was no sign of them on display. And mysteriously, when I asked the woman behind the counter about their availability, she seemed to have no idea what I was talking about. No herb-honey: an effect of the honey bee crisis? 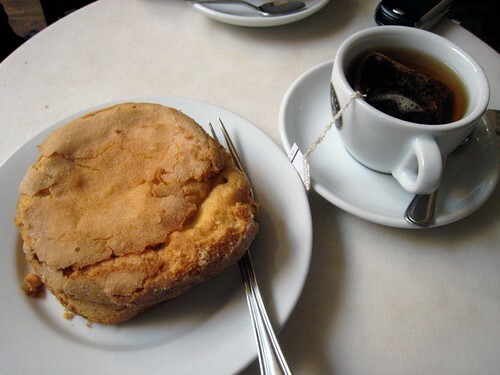 My plans thwarted, I chose a lemon oil cake for us to share, along with two cups of English Breakfast tea. The cake, while surprisingly homely in appearance, was moist, light, tender, and flavored with just the barest touch of lemon. 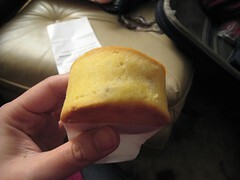 The texture was very similar to that of the paper-wrapped, popover-shaped sponge cakes sold in Asian bakeries, which are usually just vanilla. 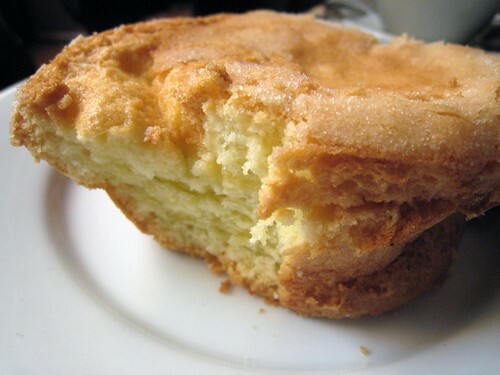 Luckily, I'm quite in love with Asian sponge cake, so I was happy with this selection. If you look carefully, you can see where JSK had started eating from the other side. 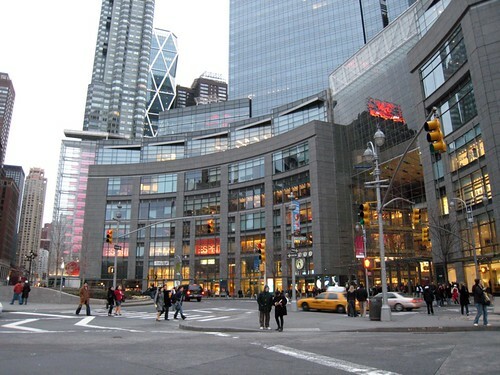 Eventually we parted ways, JSK to deliver a Playstation 3 back to his apartment, and I to wander around Columbus Circle, where I loitered outside of the Time Warner Center for a bit before heading home. I did debate going inside to check out Bouchon Bakery, but enough was enough. 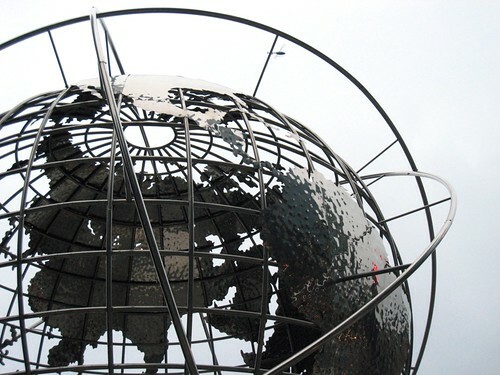 Somewhere, there is an entire set of prom photos that were taken in front of this globe…not mine of course. No, never. 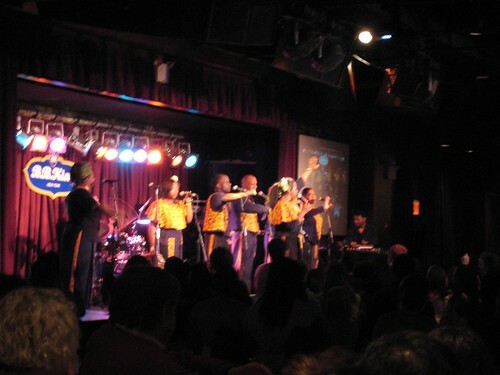 Last Sunday, I went with TC and fam to check out the Sunday Gospel Brunch at B. B. King. I was excited about going for two reasons: 1) the opportunity to see the Harlem Gospel Choir live, and 2) the extensive buffet menu of Southern food promised on B. B. King's website. 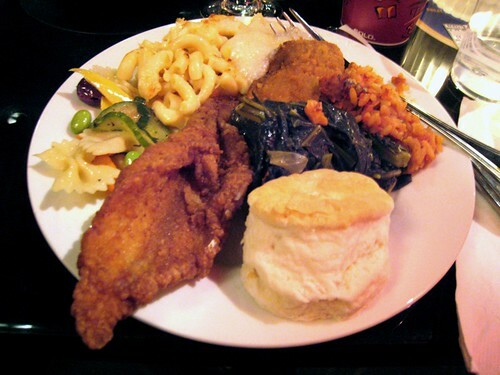 I almost never eat Southern food, mainly because it isn't very healthy, but also because I don't have many dining companions who are interested. 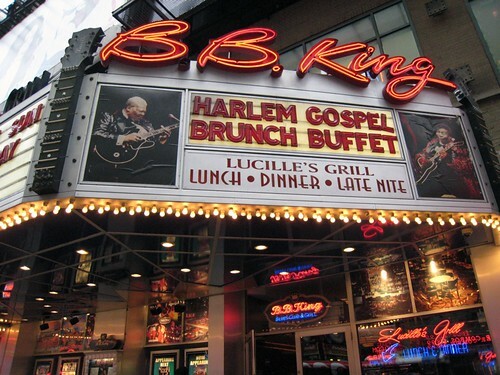 A gospel brunch at one of the biggest tourist venues in Times Square isn't the same as eating chicken and waffles at some joint up in the hundreds, but I'll take whatever opportunities I can get. That day, Kosovo had just declared its independence, and my walk from the train station to the club was filled with the wild honking of Kosovars celebrating. People were grouped on the street or hanging out of their car windows, waving flags and cheering in excitement. I couldn't help but smile at their joy. 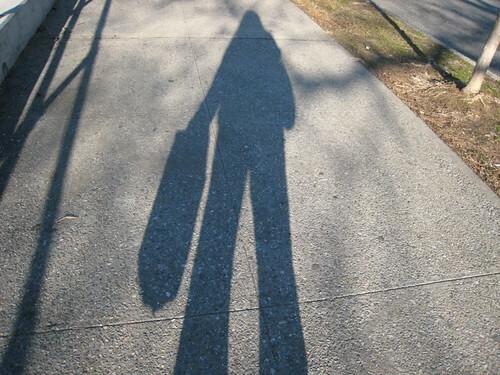 But when I arrived to B. B. Kings at 12:30 pm, the time specified on the ticket, this huge line awaited me. I was a little dismayed, but then realized I really was in for the full New York tourist experience. 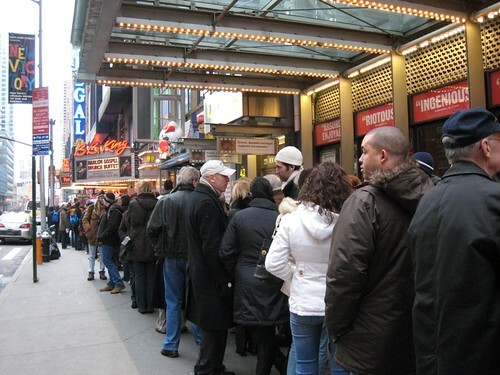 It was about half an hour before they finally opened the doors and started ushering us in. Once we entered though, things were fairly organized. A woman led the group of us to a padded circular booth along the outside walls of the room. It was crowded—more like a booth for three than for five—but we settled in well enough. Given the approximately six hundred people in the room, B. B. 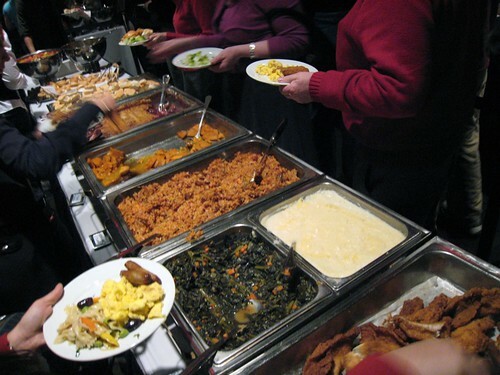 King had a specific method for allowing everyone access to the buffet: they had created four lines at two long, identical buffet tables that could be reached from either side, and called up sections one at a time to go fill their plates. Here's mine, clockwise from the top: grits, a piece of fried chicken, jambalaya, collard greens, a biscuit, a piece of fried catfish, some pasta salad, and a scoop of mac 'n' cheese. None of it was anything to make a Southerner proud. But the collard greens were spicy, and the fried chicken, while soggy-crusted, was juicy and well seasoned. And later on I snagged some pieces of perfectly crisp bacon, which pretty much makes everything right with the world. Most of the food at the Sunday Gospel Brunch was mediocre—about what you would anticipate from a giant buffet held in a nightclub. But some of it was also better than I expected. And when your meal is followed by an exuberant group of gospel singers belting out "Oh Happy Day," you just can't help but agree. 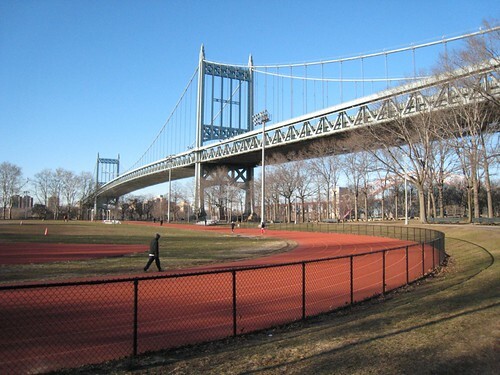 Last Sunday I spent a lazy afternoon walking around my 'hood, making my way from my apartment all the way up to the Ditmars area, stopping at Astoria Park along the way. I wandered around for several hours, moseying down new streets, taking photos, and cooing at the dogs I saw at Bugsy's dog run. After all that I got hungry, so at Ditmars I looked around for something interesting I could bring back to my apartment for dinner. 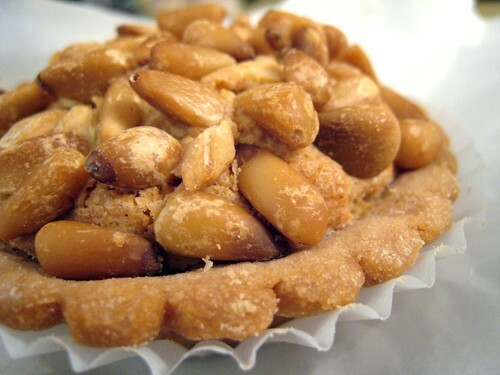 I passed up a cannoli from one of my favorite bakeries, Rose and Joe's, in favor of a small pignoli tart from La Guli. 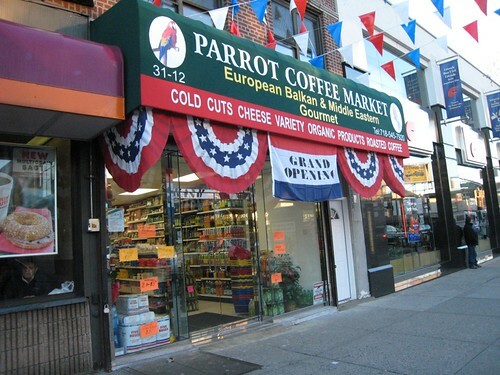 Later, spotting the grand opening banners at Parrot Coffee Market, I wandered into what turned out to be a new international grocery, full of all sorts of interesting European imports. The friendly woman behind the counter urged me to sample a piece of their freshly made pistachio Turkish delight. It was delish…I can totally see why Edmund sold out to the White Witch. I was tempted to buy some, but as I already had the pignoli tart I went with a slice of their cheese bourek. 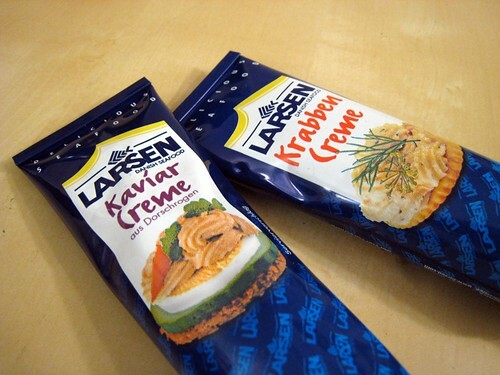 I also picked up these tubes of "Krabben" and "Kaviar" creme (maybe I should spell it "kreme") for LB and JL. Then, too lazy to make the walk home, I hopped on the N train back to my apartment. 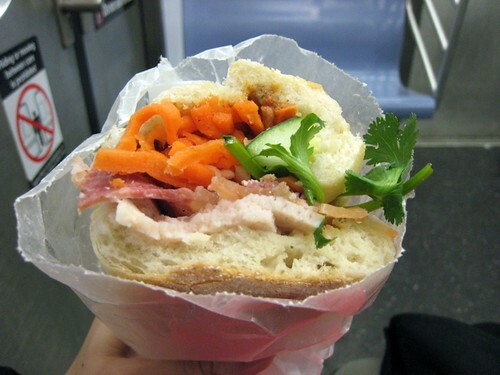 From the outside, Sau Voi Corporation looks like store full of bric-a-brac, but inside, they sell a mean bánh mì. I've grown fond of the sandwiches at this place because of the layer of dark, peppery pâté they include in their version—and also because of its proximity to the train station. Yes, there might better elsewhere, but whenever I crave bánh mì and don't feel like venturing too far into Chinatown, I make a quick stop here. 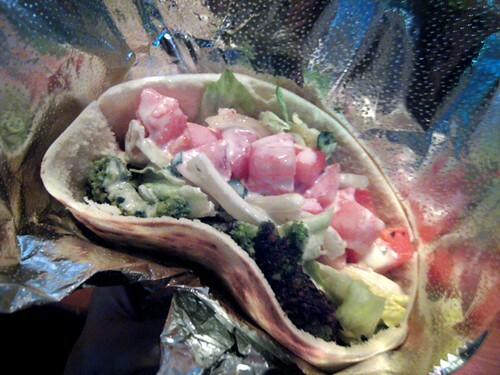 When I was in college Mamoun's seemed like the greatest thing on earth: two bucks for a huge, filling falafel sandwich. Now, six years later, I'm taken aback at how not great Mamoun's is. The sandwich I got last week was a thin, dry pita filled with iceberg lettuce, pale and tasteless chopped tomatoes, strong white onions, overly salty falafel, and a tablespoon or two of watery tahini. After eating half, I probably would have thrown out the rest if SYB hadn't finished it for me. After only ten minutes at Grassroots Tavern, MH and I decided that we needed something sweet to follow our respective dinners. 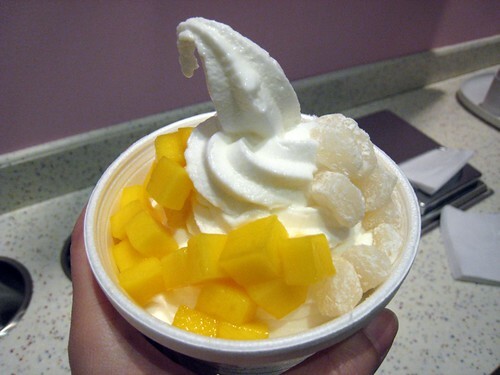 At the end of the block, the folks at Very Berry dished up frozen yogurt obviously similar to the ever-popular Pinkberry, down to the little cubes of cornstarch-dusted sweet mochi sitting on top of my small plain yogurt. Tastewise, Very Berry's plain flavor is identical to Pinkberry's, and so are the toppings. But Very Berry offers blueberry and strawberry flavors in addition to their plain and green tea, and it's also a bit cheaper. On our way back to the bar, merrily consuming our frozen yogurt, we passed construction and a sign announcing Pinkberry's imminent arrival just three or four doors away. I wonder what will happen to Very Berry when it opens? While I was browsing the selection at Fairway several days ago, the distinctive appearance of this Morbier cheese caught my eye and I decided to pick up a hunk. 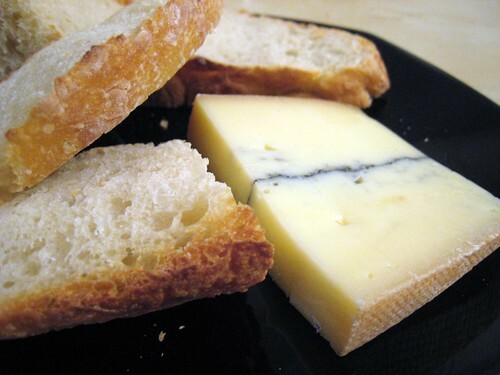 Morbier—creamy, fruity, pleasantly stinky—is traditionally made with the leftover curds from other cheeses. The dark line running through the middle comes from the layer of ash that prevents the evening curds from forming a rind before the morning curds are added the next day. Apparently nowadays this line is purely decorative, but Morbier, along with some crusty bread, makes for a delicious dinner anyway. I've been at my current job for about four years now. Sweets show up often in my workplace—there are cupcakes for birthdays, donuts for meetings, and piles of homemade cookies for when the editors take on the slush pile. There are also the sweets that come in as gifts and thank-yous: near Christmas, one author always delivers several varieties of biscotti, and another sends on tins of extremely potent rum balls, thereby ensuring that the entire office is a little tipsy for an afternoon. 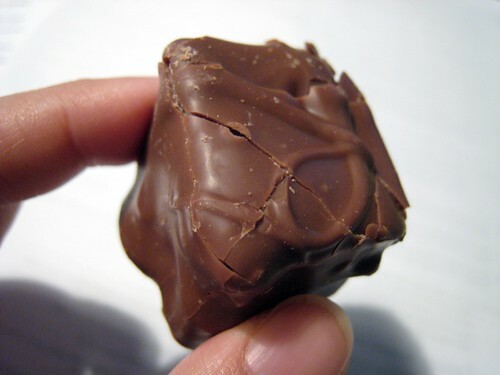 And every Valentine's Day, one of our vendors gives my department a box of hand-dipped, chocolate-covered marshmallows. 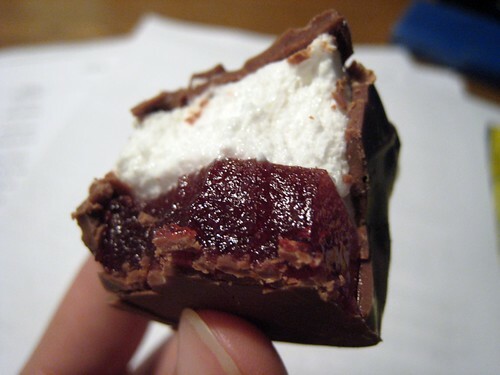 Sneaky, sneaky…this time, the milk chocolate shell hid not just a square of marshmallow, but also a thick layer of bright raspberry jelly. I've baked several different batches of bread by now, and I always love putting my palm on the risen bread dough: each soft, smooth orb always feels so warm and alive (which, I suppose, it is). 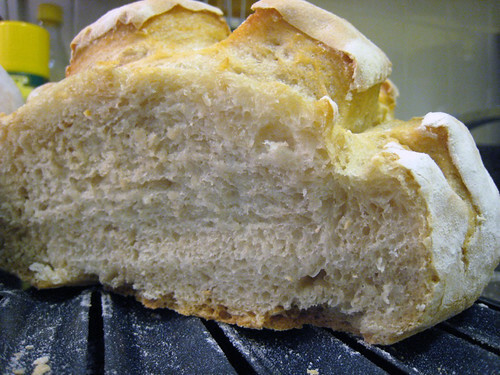 Bread is something elemental and essential, and it's amazingly, perfectly simple. Neruda's poem expresses this idea so beautifully I had to include a excerpt here. Flour, salt, yeast, water. I messed up the proportions a lot this time, as I got distracted and lost count while I was measuring out the flour and may (or may not) have added an extra cup. Not yet experienced enough to figure out by touch, I added more water to the dough, a little less than a cup. Which I then determined was too much, so I then added in one more cup of white whole wheat flour. 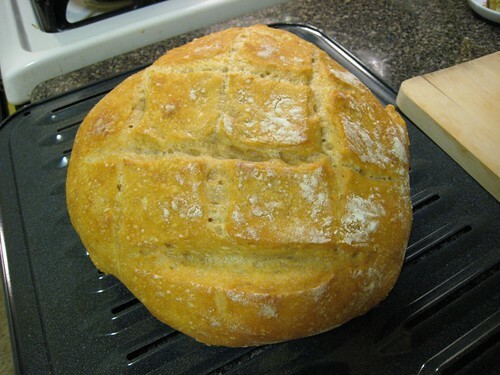 In the end, I believe I had either 6.5 or 7.5 cups of white bread flour, 1 cup of white whole wheat flour, 4 cups of water, 1.5 tablespoons salt, and 1.5 tablespoons yeast. I let this mixture rise for 3.5 hours instead of 2 before putting it in the refrigerator. I also kneaded the dough quite a lot while forming the loaves for the second rise, as I felt I had failed to adequately mix in the extra white whole wheat flour. I figured I would just let them rise again longer, until those yeasty beasties properly inflated the dough again. In any case, I gave one loaf to my family and sliced up most of the second loaf to store in the freezer. 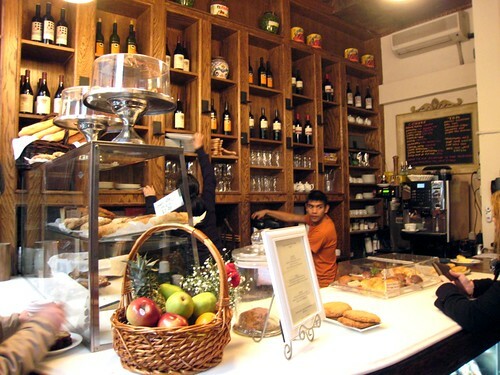 And some, well, I just ate standing over the counter, savoring each warm bite of chewy, crackly bread. 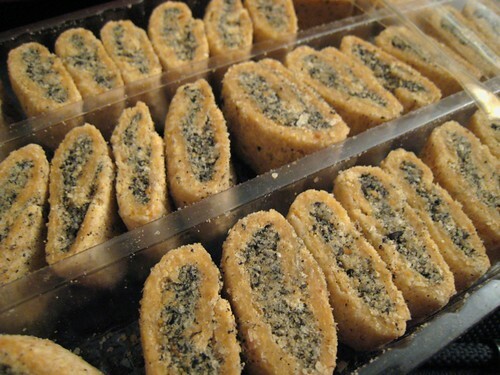 The above is a crumbly, peanut-flake-type confection filled with ground black sesame seeds, from Taiwan. After taking care of my grandmother there for the last month, my mom had returned to New York last week with her two suitcases packed with treats. 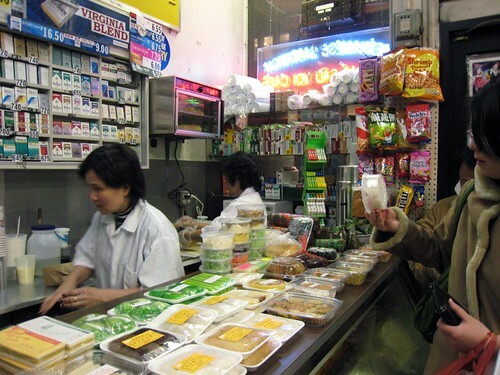 Along with candies, pastries, and a bunch of packaged snacks, she also lugged back heavy jars of fermented tofu paste, peanut-studded hot sauce, and pickled vegetables. You see where I get my dedication to food from? 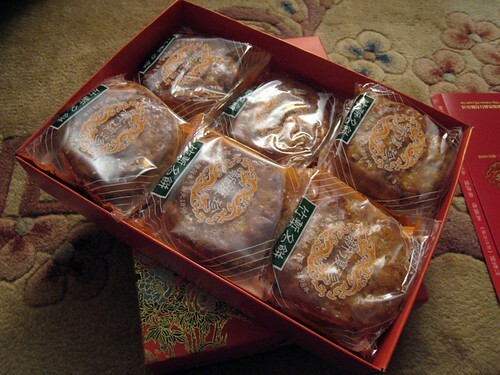 I've noticed that pineapple shortbread is sort of a ubiquitous Taiwan gift: it's what people bestow upon us while we're there, what we bring back to give to other people, and what other people coming back from Taiwan give to us. Consequently, I've come to view pineapple shortbreads as standard pastry, but these—a gift from my cousin as a thank-you for a pair of earrings I had made her—were excellent. The fresh, buttery crust just barely encased the soft, sweet, fruity pineapple jam. These look huge here but they're not (they're about the size of baby carrots). I don't really know what to call these snacks, but they are essentially small, crisp logs of dough that have been fried and glazed with sugar. The fry oil might have been lard; they were a bit heavy. I was satisfied after just a few. There were little squidgy, salty bits of ham fat in these pastries, which played nicely against the sugared-melon filling and the layer of toasted sesame seeds coating the underside. (This might seem like an odd combination, but it's actually pretty classic.) The box says each is about 200 calories, but I feel this must be a lie. A dirty, dirty lie engineered to allow me to eat more ham-fat-and-melon pastries. 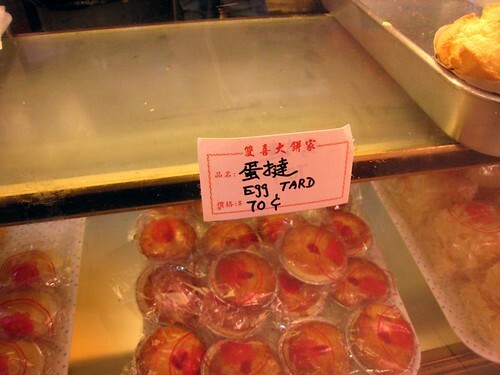 Now, if only it were possible to bring back some of the goodies from the night markets in Taiwan! I was talking to RT today about how I don't often cook meat—along with its cost, and its toll on the environment, I'm just not crazy about its smell when raw and the cold, slippery feel of it. Plus, I always feel like I'm spreading bacteria all over my kitchen whenever I tackle the stuff. But I do cook fish. For some reason I find sea creatures easier to handle than, y'know, land beasts. 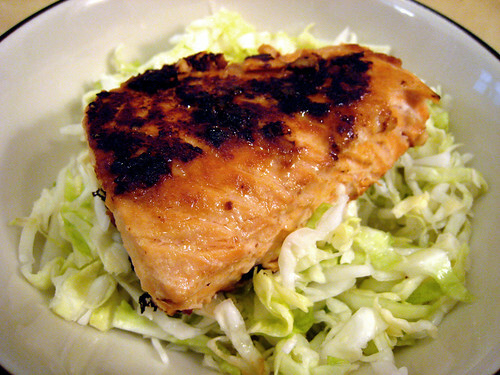 This particular salmon recipe has an extremely short list of ingredients (salmon fillets, miso paste, chopped garlic) and an almost-as-short list of directions (thin out the miso with water, slather that and garlic over the salmon, let marinate, pan-fry, serve). When I have scallions I'll use those instead of garlic, which is good too. And I imagine you could thin out the miso with soy sauce, or sake, or some other flavorful liquid instead of just plain water, but I haven't experimented much with that. The slaw underneath is another super simple dish: shredded cabbage marinated overnight in rice wine vinegar and a bit o' sugar and salt. These are both sort of old standards for me because they're dead easy and tasty. Neither are particularly refined, so generally I just make them for solo weeknight dinners, but I've also served the salmon on short notice for guests since I usually have the ingredients on hand and it's quick. With a pot of rice and some steamed veg on the side, miso salmon is served! 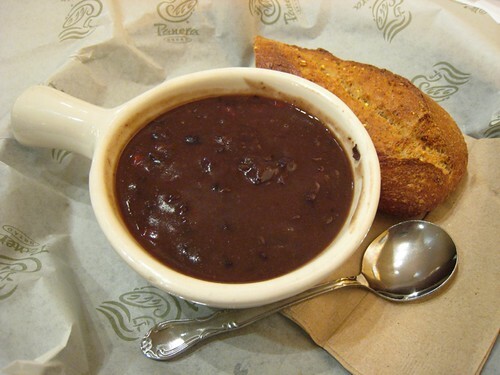 Unbearably salty vegetarian black bean soup and okay whole-grain baguette from Panera. I find myself at this place much too often, and am too-often dismayed at the completely soulless food on offer here. The food is generic and cafeteria-like. The pastries are always stale. Everything is oversalted or too sweet. It would be one thing if they didn't put so much emphasis on "tradition" and "artisan" and "fresh-baked." But they do. Deep-fried stuffed avocado from Izakaya 10. I gotta say, I was skeptical but this was pretty awesome. 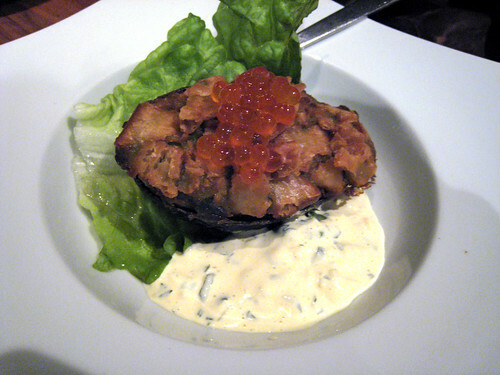 The avocado was creamy and sweet, and the salmon roe added bursts of salty brine. The accompanying tartar sauce worked beautifully as a bright, tangy counterpoint. For the Lunar New Year, I wanted to bring in something tasty to share with my coworkers. 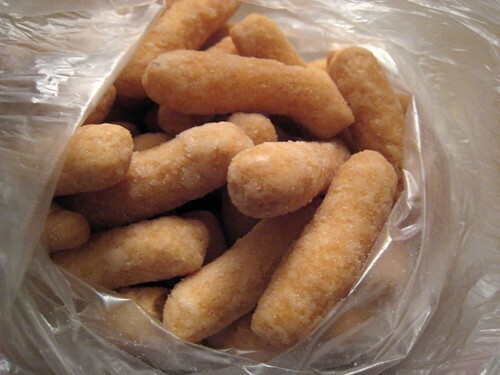 In previous years, I had made kai kou xiao, or "laughing cookies": round, sesame-encrusted sweets that are so named because the split that appears in the cookie after it is deep-fried has the shape of an open, laughing mouth. 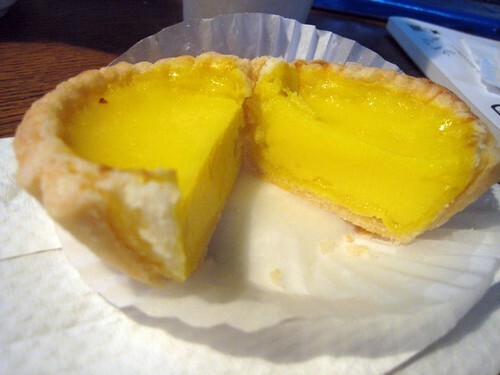 However, this year I wanted to do something different, so I opted to bring in a bunch of dan ta, or egg custard tarts. The night before Lunar New Year's Eve, my brother and I ran around five or six different bakeries in Chinatown, hunting for the best versions before I had to make my way to Amazing 66 for this meal. 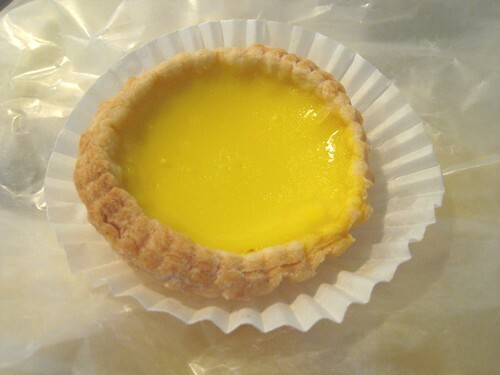 In one bakery, from which my brother ended up picking up a few dozen, one woman gave me a dan ta made with only egg whites to sample. To my surprise, it tasted just as eggy as its yolkier brethren, which I suppose makes it a good choice for people trying to watch their cholesterol levels (just don't fool yourself into thinking that it's healthy). Unfortunately I don't remember which bakery I ultimately purchased mine from. What I do remember is that I cleaned out the last ones remaining, so the case you see at the top actually had a tray of tarts sitting in there just moments before. Alas, we are only left with Egg Tards. These were okay, but I've had better. I generally prefer the crusts that are flaky and in layers, as opposed to the crusts that are more like shortbread cookies. 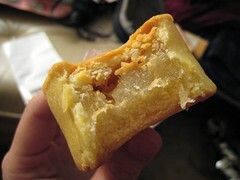 This was certainly the flaky kind, but something about the crust just seemed flavorless. It was also a bit soggy, but as I only sampled one the next day, I assume they would be fine eaten fresh. I always love dan ta, though, no matter what the crust. Two nights before the Lunar New Year, I and eleven other food-loving friends met up at Amazing 66 for an early celebration. This wasn't my first time here, as it was for a number of those in attendance, but I was happy to have the opportunity to try other dishes I hadn't gotten to last time. Everything was pretty delicious overall, so here I'll just go through some highlights. The above is one of two dishes that I had to order a day in advance. 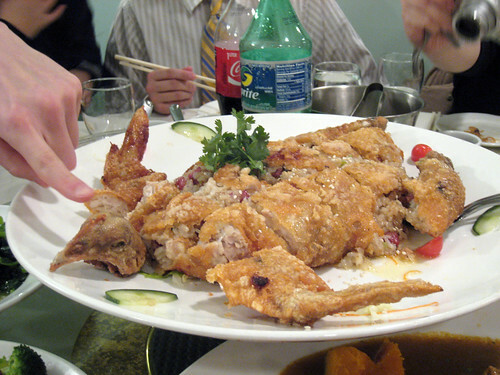 A whole chicken, innards and bones removed, stuffed with sticky rice and then deep fried. 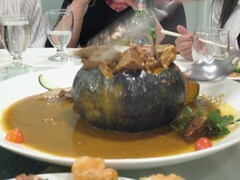 It was essentially a giant chicken-shaped mass of rice encased in crispy skin. Soooo over the top. 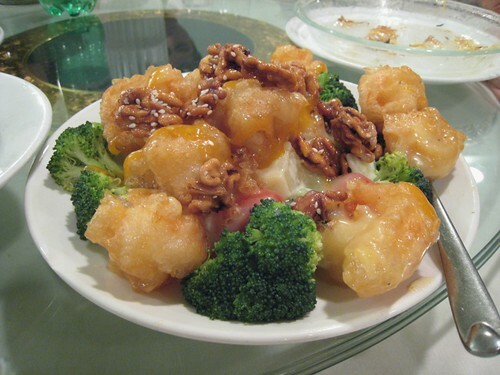 "Salad prawns with walnut" is definitely the oddest dish ever, but it's always had a special place in my heart. Fried shrimp! Candied walnuts! Melon cubes! Broccoli! Cherry tomatoes! Sweet mayo! It doesn't get much trashier, but I'm not complaining. 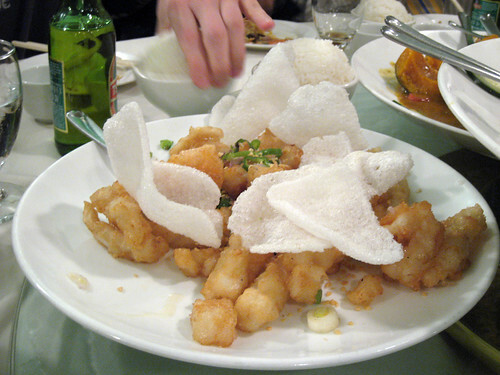 This version was especially well executed, with giant, practically greaseless fried shrimp that were still crispy under a glaze of sweet mayonnaise. 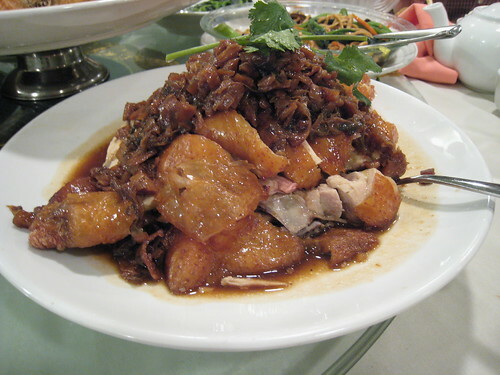 Half order of the "roast chicken with preserved vegetables." The chicken was juicy and tender, and the saucy, salty-sweet veg on top went really well with it (the magical preserved veg was tasty on a bowl of rice as well). I originally ordered the full size, but the waiter had looked at me disbelievingly: "You already have the sticky rice chicken—you want TWO whole chickens?" So I gave in and settled on the half. "Mixed fried seafood." This was fresh-tasting and well fried. Someone in the kitchen is doing a great job at the fry station. 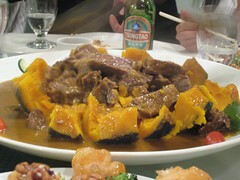 The "beef short rib in pumpkin" is a showstopper, as the waiter brings the steaming pumpkin over to the table whole, and then proceeds to rapidly slice it open, revealing its meaty innards. This is the other dish I had to order in advance, though I think that might not be necessary anymore. At my previous meal at Amazing 66, I thought this dish had came out a bit cold, but this time there was no such problem. MH did complain that the meat wasn't as tender though. Ah well! We also ordered e-fu noodles with mushrooms, sauteed pea shoots, an oyster and ginger/scallion casserole, pan-fried noodles with seafood, and a whole steamed flounder. And at the end they brought out orange wedges and bowls of hot red-bean-and-tapioca dessert soup, which made for a perfectly sweet ending. I think we all ate until capacity that night, and to my awe we ended up with only a few leftovers to pack up. But I'll be back again: there have been murmurs of Peking duck for the future! I combined the remaining two portions of dough from this attempt to make this one large loaf. When I got home today I immediately took the bowl of dough out of the refrigerator and set it on the counter while I showered, changed, and otherwise settled in. 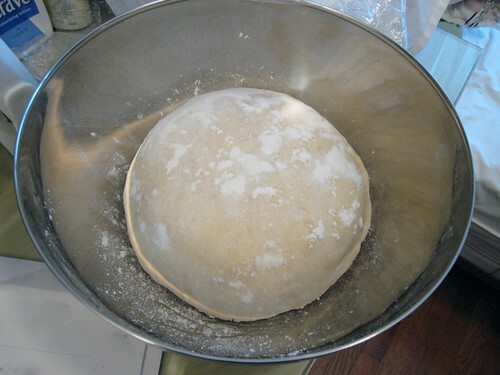 When I was done, I took the dough out and shaped it all into one round loaf, covering it with plastic wrap for its second rise. Then I took a nap. Due to my special talent at hitting the snooze button, the loaf rose for about two and a half hours before I finally got myself out of bed to deal with it. It was nice and poufy by then. 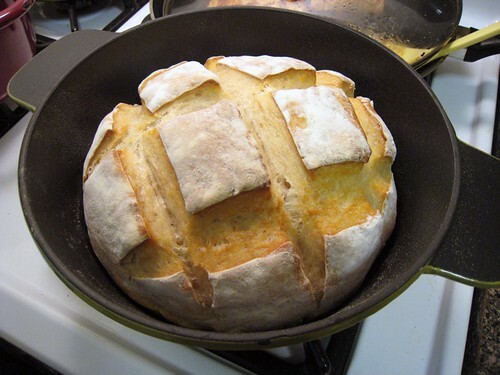 I preheated the oven, sprinkled the loaf with flour and slashed the top, and then dropped the dough (lopsidedly) into the pot and baked it for twenty minutes covered, ten minutes uncovered. I was much happier with this loaf, although the flavor didn't seem to change much despite sitting in the refrigerator for over a week. I loved the chewy, moist interior; the crust was still a bit wimpy. 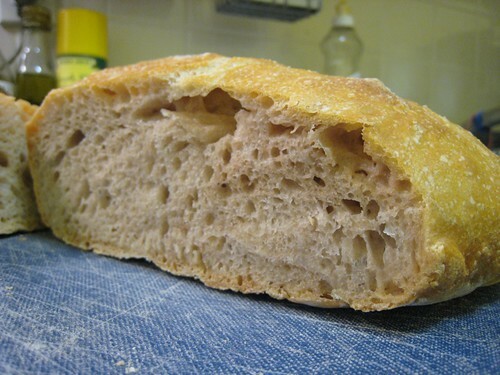 But this is a good, serviceable bread, and the dough, being less wet than the no-knead, is a lot easier to handle. 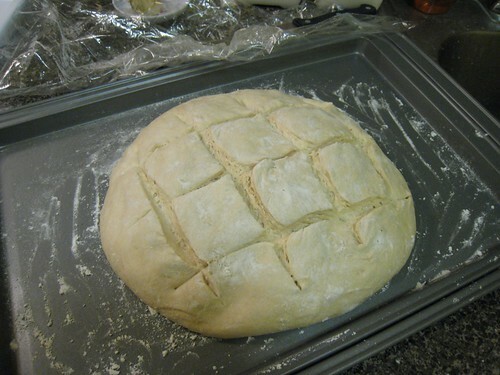 I will still try a loaf or two using all white bread flour instead of mixing in white whole wheat. Hopefully this will change how much the loaves rise and the flavor profile. Otherwise, I may routinely double all my dough from now on, as I am much more into this large size (better inside-to-crust ratio). This batch was made with the remaining dough in the freezer from this first attempt. 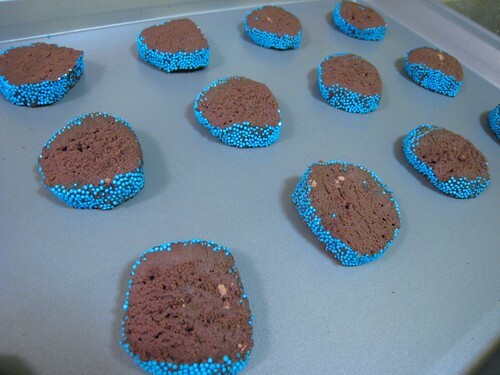 As I was bringing these to a Superbowl party I rolled the edges in blue nonpareils in honor of the Giants (I'm a New Yorker after all!). I wish I had found a darker blue closer to the actual color of their uniforms but the cake supply shop I went to only had them in this shade. These sliced better after being frozen overnight, though they still got a little sticky and soft as I was cutting. I baked these for somewhere between 10-11 minutes instead of 12, and this seemed to help keep them from drying out too much. Those pale spots you see in the cookies are clumps of cocoa that I had failed to properly incorporate. Um, I did mention I'm a novice, right? I realize that with the cakey texture (from the cocoa I used? 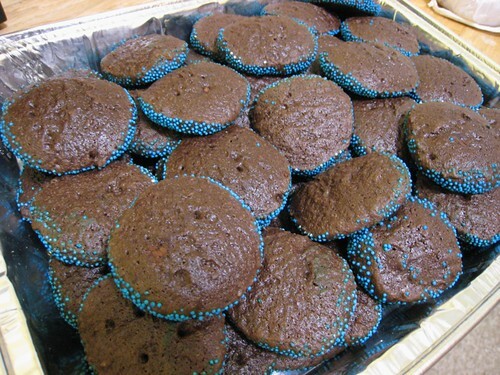 ), these are sort of like dry brownies in cookie form more than anything else. They are decent and satisfy any chocolate cravings, but I'm not sure I will revisit this recipe, at least not without the proper cocoa to see if that makes a difference. And my fingers are still stained blue. . . .